This is a recent painting from my app series. It features a tipsy macho man surrounded by his compartmentalized “baggage”, rooster and clown suits which hang within arm’s length (no suits required in this case, however). The man is in mid-dancing step, possibly unaware, in denial or simply oblivious to his shortcomings, shenanigans and overall buffoonery…. enjoy! I hope everybody has a great first day of Autumn. Will be in attendance at the Richmond’s Art Center reception Saturday, September 24th, 2011 2- 4 pm celebrating their 75th Year Anniversary Exhibition “Beyond Tradition: Art Legacies at the Richmond Art Center, Part II. 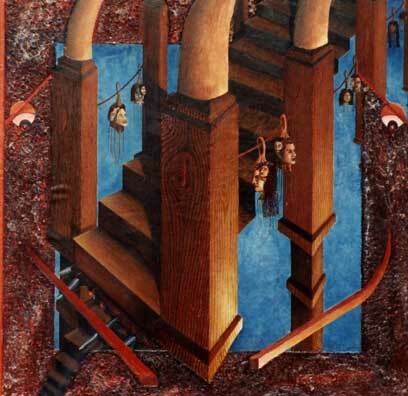 My 1993 painting “The Big Stairs” is included in the exhibit. it has a few new updates including a new featured painting with bilingual (spanish-english) description as well as a few recent paintings in the 2008-2011 painting gallery…. Esta pintura es como un nuevo comienzo para mí, pero también un escisión de los temas que he estado trabjando desde aproximadamente el año 2003 que refieren a una variedad de temas que superficialmente confrontan al espectador con la omnipresencia de la tecnología. Dentro del marco del equipo de Windows, YouTube y media social, esta obra “inicia” mis investigaciones de las aplicaciones ubicuas. Por supuesto, el tema es una continuacion de mis preocupaciones con el teatro humano, pero en este caso, estoy interesado en la creacion, en la invencion de absurda aplicaciones que a menudo son muy necesarias para revelar, sanar, conectar, o de alguna manera “arreglar” y corregir una deficiencia, una urgencia, la necesidad, un defecto, etc. La imagen de la pintura “app para revelar otros seres” demuestra lo fácil que puede ser tener nuestro “aparato inteligente”, descargar o escanear un código QR y revelar, redescubrir o incluso nosotros mismos desenterrar nuestros otros seres para confrontar a otros planos complejos del microcosmos dentro de nuestra psiques… disfrute ! This painting is a sort of new beginning for me, yet also a spin-off of the themes that I’ve been working on since about 2003 which deal with a variety of themes yet superficially confront the viewer with the pervasiveness of technology. Within the framework of computer windows, youtube and social media, this piece “kicks off” my investigations into the ubiquitous world of apps. Of course, the subject matter is a continuation of my preoccupations with the human theater, but in this specific case, I am interested in creating, in inventing absurd yet often much needed applications that reveal, heal, connect, or otherwise “fix” and correct a deficiency, urge, need, short-comings, etc. 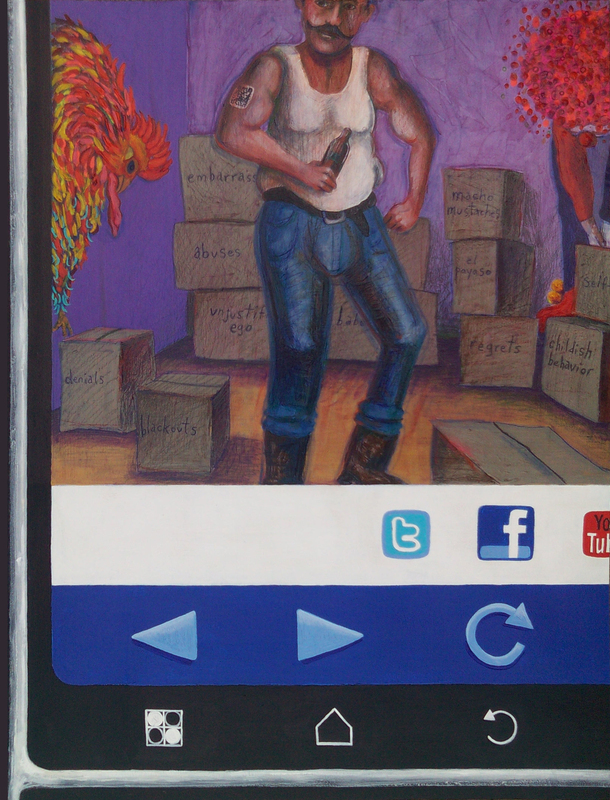 The image on the painting “app 4 revealing other selves” demonstrates how easy it may be to take our smart device, download or scan a QR code and reveal, re-discover or even disinter our other selves to confront those complex other planes and microcosms within our psyches… enjoy! Just finished “youtube.com/lovers” (28″ x 22″ acrylic, pencils & oil on board). The theme is a continuation of the mental compartmentalizing and “hoarding” experience series. The boxes in the paintings are a symbol for personal “baggage”. This is the fourth piece on the series. I enjoy exploring and elaborating on a theme by re-visiting and often re-contextualizing “themes” or images. On the right arm of the young man he has a tattoo of a scannable QR bar code which allows potential customers – instantly learn more about a business, by visiting a mobile version of the business’ place page on any supported phone. I am intrigue by the ability we may have to instantly absorb, collect, and become part of a product or experience by using a smart device. This a direction I wish to explore. Luis Pinedo curated Losing Count – Cuentas Perdidas. Once in Mexico the work on paper will remain in the permanent collection in Guadalajara, Jalisco, Mexico; September 7 – November 4, 2011. This exhibition is the second of two parts in which various artists from the 1940s through the present exhibit and celebrate the Richmond Art Center’s 75th anniversary. The exhibition features over 70 influential, esteemed and luminary artist including Hung Liu, Enrique Chagoya, Squeak Carnwath, Peter Voulkos, Gertrud Parker, and Rae Louis Hayward. I have been invited to participate because I had previously exhibited my work at the Richmond Art Center including a solo exhibition: “Intermedios: Solo Exhibition by Gabriel Navar” in 2001. The reception will take place Saturday, September 24th 2011 from 2 – 4 pm. The exhibition will run from September 17 – November 12, 2011.